NOTE: The CDC has identified French Guiana as an affected area of the Zika outbreak. Pregnant women are advised to be cautious as the virus can lead to birth defects. Adults affected by the virus experience fever, rash, joint pain, and conjunctivitis (red eyes) typically lasting a week. You can learn more by visiting the official CDC website. 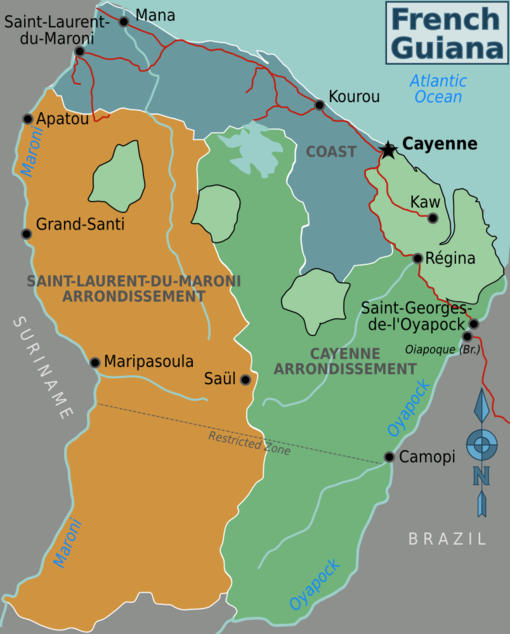 French Guiana (French: Guyane or Guyane française) is a department of France in the Amazonia region of South America, bordering the North Atlantic Ocean, between Brazil and Suriname. It is governed as an overseas province of France with same rights and privileges granted to all other French departments and benefits financially from this arrangement. First settled by the French in 1604, French Guiana was the site of notorious penal prisons known as "le Bagne" which functioned from the mid 19th century until 1951. The most famous of which is Devil's Island. Henri Charrière wrote his tale "Papillon" about an escape from here. The European Space Agency also launches its communication satellites from Kourou. French Guyana is the only portion of mainland South America still governed by an overseas nation. Almost entirely covered in rainforests, with numerous creeks and small rivers. The territory is almost entirely separated from its neighbours by two rivers: the Oyapok to the east and the Maroni to the west. There are three small islands, the Iles du Salut, off the coast of Kourou. Low-lying coastal plains rising to hills and small mountains, mostly an unsettled wilderness. It also consists of hill plateaus and the Tumuc-humac mountains. Tropical; hot, humid; little seasonal temperature variation although it is a little cooler when the rainy season starts (from November/December through July, though there is usually a period called "the little summer" where there is less rain, usually in March). The vast majority of the population is concentrated in towns and villages on the coastline. The French Guianan population is highly multicultural, being composed of (but not limited to) Native Americans, Europeans, Brazilians, Chinese, Haitians and Libyans. Concerning immigration, French Guiana has different laws. French Guiana is not part of the Schengen territory. For some neighbouring countries (Brazil, Suriname, Dominican Republic etc.) it is easier to go to Paris than it is to reach Cayenne. Citizens of the European Union and European Economic Area, Andorra, Monaco, San Marino and Switzerland can visit, stay and work visa-free for a unlimited time in French Guiana. Citizens of the countries mentioned above may enter French Guiana using a national identity card as a travel document. Citizens of Antigua and Barbuda, Australia, Bahamas, Barbados, Bermuda, Bolivia, Brunei, Canada, Chile, Costa Rica, Ecuador, El Salvador, Guatemala, Honduras, Hong Kong, Israel, Japan, Macau, Malaysia, Mauritius, Mexico, Montserrat, New Zealand, Nicaragua, Panama, Paraguay, Saint Kitts and Nevis, Saint Lucia, Seychelles, Singapore, South Korea, United States, Uruguay, Vatican City, Venezuela, BOT citizens and subjects, and holders of a valid EU long-term visa or resident permit issued by a Schengen country can visit visa-free for up to 90 days. Citizens of Albania, Bosnia and Herzegovina, Macedonia, Moldova, Montenegro, and Serbia who hold a biometric passport can visit visa-free for up to 90 days. Emergency services members and Special authorising cross-border travel card holders of Oiapoque, Amapá can visit Saint-Georges-de-d'Oyapok visa-free for up to 72 hours. A yellow fever vaccination is also essential. The Oyapock River Bridge is a cable-stayed bridge, the two towers rising to 83m high. Its length is 378m, it has two lanes of 3.50m wide. The vertical clearance under the bridge is 15m. It spans the Oyapock River to link the cities of Oiapoque in Brazil and Saint-Georges de l'Oyapock in French Guiana. Its construction was completed in August 2011, however opening of the bridge was delayed by several years. The bridge was eventually opened for private vehicles and pedestrians on 20 March 2017, even though the Brazilian border post was still not completed at that time. At the French side, the access will be through a border checkpoint (FCP) which will present three government controls: the Border Police, the Customs and the Directorate for Food, Agriculture and Forestry. The bridge over the Oyapock is a toll-free bridge (the booths are controls, not toll booths), which will be accessible to both vehicles and pedestrians. From Brazil and Suriname, to cross the rivers Oyapoque and Le Maroni, which takes 15 minutes, it's not very expensive, but you have to haggle. Crossing the Oyapoque from Brazil should cost you about €5, no haggling. If you go a little upstream to Rona's lodge, you should pay €7. Ask first to be sure but the boatmen are a co-operative and the price is fixed for everyone. 3,400km of French Guiana's waterways are navigable by native boats called pirogues. 460km is navigable by small ocean-going vessels and coastal and river steamers. There is limited public transport throughout the territory. Minibuses go between major towns but there may only be a few per day. Fares are fixed per route; if only going partial distance to Cayenne you may have to pay the full fare. Eg. St. Laurent du Maroni to Kourou you may have to pay the full fare to Cayenne. Fare for St. Laurent to Cayenne is €50, for Kourou to Cayenne €10, Saint-Georges to Cayenne €40. There is a bus that runs from the airport to the centre of Cayenne, contact the people at the information desk at the airport to be sure the driver stops to pick you up. There are numerous taxis. They are comfortable but very expensive. A journey from the airport to Cayenne would cost you €35 and the price for a taxi from Cayenne to Kourou could get as high as €85. There are lots of possibilities for renting cars on the airport and in Cayenne and the other bigger villages. French is the official language of French Guiana, although Creole is widely spoken. The majority of the population speaks French while few understand English. However, some officials, police, and gendarmes may speak English. Because of the presence of many Brazilians and Dominicans, many people understand basic Portuguese and basic Spanish. On the Maroni river, Taki-taki is often used. The Hmong Market at Cacao, the Kaw river by pirogue, a rocket liftoff from La Carapa, Kourou, le Bagne de Saint-Laurent, Les Iles du Salut/the Salvation Islands or Papillon's prison, sea turtles laying eggs on the beach at Remire-Montjoly, Awala-Yalimapo and the annual Kalinia games, etc. The official currency is the euro (€) just like in mainland France. There are numerous wood artists in French Guiana. They make things such as wooden snakes and flowers. The indigenous Tembé people make traditional expressive drawings. The French Guianan cuisine is very diverse. You can see people eat fish, game meat, vegetables and exotic fruits. For tourists, the dishes may seem too spicy. If you have a sensitive stomach, don't hesitate to ask at a restaurant to make the food less spicy than they normally do. Guianans are fond of smoked fish and meat, which is part of their traditional cuisine. These dishes are frequently served with rice, red beans or cassave chips. Bouillon d'Awara, excellent Guianan dish, broth on basis of awara, a palm fruit. Colombo, indigenous dish with pork or chicken. Lentils with game meat or fish. Kalou or Kalalou, smoked fish with spinach and okra. Pimentade, fish with tomato sauce, spiced and seasoned with lemon. Blaf de poisson, fish prepared in broth. Roti couniad, grilled fish with chips. The local rum is very good and not expensive. In the urban areas of Cayenne, Saint-Laurent and Kourou, there are plenty of hotels. Prices have been on the rise but rooms are mostly good. The university of the Antilles and Guyane has a branch in French Guiana, with three faculties (teacher training, medicine and nursing) in Cayenne and a technological institute in Kourou. For residents of an EU country and Switzerland, working in French Guiana is allowed without problem. If you're from outside the EU, you will probably need a work permit - check with the French Embassy in your country. Do not forget though that the unemployment rate is high. But if you work in the health sector (doctor, nurse), it will be much easier. Malaria is also a risk. Being so far away from metropolitan France, it is often forgotten that the Guianese are, as well as a distinct people in their own right, also French citizens. Don't let them seem either one of those too much, they are in between and value both their own culture and their French citizenship. This page was last edited on 22 January 2019, at 06:41.